It doesn't matter who you are, you will only meet a few really exceptional and inspiring people in your life, people who make you look at yourself and wonder what you could achieve, who make everyone around them strive to be better. I was lucky enough to meet one such person when I was travelling around the world. I bring this up because I was going through some of my old online journal entries of my travels in order to put them up on one of my other sites when I spotted a link for Ryan Correy's site, ryansdream.com. I met Ryan in the hostel in Banff in the Canadian Rockies. He lives in Calgary and was stopping over for a couple of days because he was early for his return party. He was returning from a sponsored ride around the United States, a total journey of about 14,000 km (I've no idea if that figure is accurate, but it's the one I have written down). That's right, around the whole of the United States, starting from Calgary, on a bicycle. Unfortunately for Ryan, he hadn't got the sponsorship he wanted and hadn't raised much for his chosen charity (as I recall). Anyway, while reading the article I thought I'd see if the link was still working and to my surprise, there wasn't just a site up, but he's also gone for another sponsored ride. He's managed to get some backing and is challenging for the world record for cycling the Pan American Highway (Alaska to Argentina) -- the longest road in the world at 25,000 km. The current record stands at 140 days and Ryan is trying to do it in 120, again, all for the benefit of others. 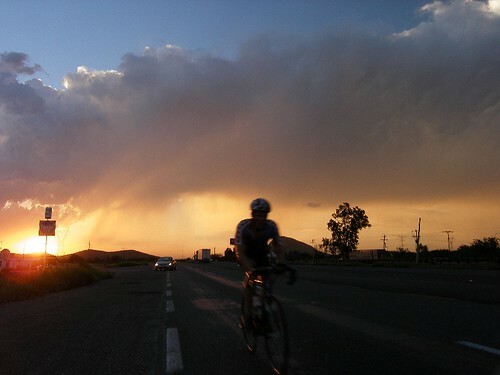 He's currently nearing the end of his journey, but to find out more about it, reas Ryan's on-the-road updates, check out the pictures and, more importantly, donate some cash, drop by the official ride site hosted by Bow Cycles. Like I said, I've met Ryan, he's a great guy, you couldn't hope to meet someone more likeable (though he can't hold his drink, his excuse was that he was tired after cycling 14,000 km and having zero body fat, but I don't believe that for a second), so please go and make a donation.